BlackBerry officially launched the BlackBerry Classic at an event in New York’s financial district on Wednesday. 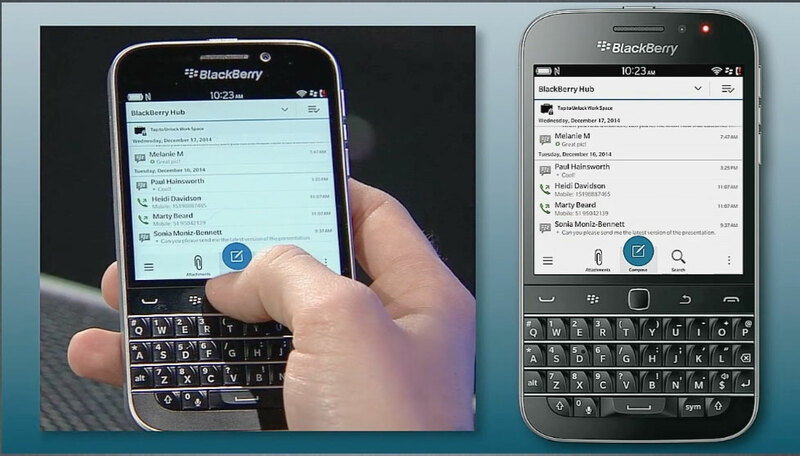 It’s the first new BlackBerry device since 2011 to actually resemble what most people think of when they think “BlackBerry”: A QWERTY keyboard-equipped phone with physical navigation keys, including a touch trackpad. Because many people upgrading to the BlackBerry Classic are coming from years-old devices, the specs aren’t paramount, but they still pack a few nice upgrades. The Classic has a 720×720-pixel, 3.5-inch touchscreen and an 8 MP camera on the back. It will be able to tap into speedy LTE networks and it’s powered by a Qualcomm chip. The specs are generally inferior to those of the Blackberry Passport, the company’s new flagship device, which has an unusual square body. In the United States, both AT&T and[company]Verizon[/company] have said they’ll carry the BlackBerry Classic, but the carriers haven’t offered details on when or how much it will cost. You can buy an unlocked BlackBerry Classic that works on [company]AT&T[/company]and [company]T-Mobile[/company] for $449 from BlackBerry World. BlackBerry 10.3.1 is a pretty big upgrade from the operating system on the Bold 9900. It’s optimized for touch, has a modern browser, and, perhaps most importantly, it can run Android apps from the Amazon Appstore as well as native BlackBerry apps from BlackBerry World. In the middle of the launch presentation, [company]BlackBerry[/company] discussed Brickbreaker, a game on the Classic that was notoriously pre-installed on all BlackBerrys during the company’s glory years. It was an appeal to former BlackBerry users who remember killing hours playing the Breakout clone, which takes advantage of the Classic’s new (and old) trackpad. But you don’t see Nokia or Microsoft talking about Snake when launching a new Lumia. Perhaps appealing to nostalgia is not the best way to get traction in the fast-moving mobile world. I still have the BlackBerry9810. I wont part with it for one of the bigger ones. Might go for the Classic. Love my BlackBerry. I’ve had the z10 from its arrival date…. but would quickly switch to the classic…. #BB4LIFE! I am so ready to go back to black! You should perhaps mention, that you can also use most of the apps from Google Play.